Following a long time trying I have found a solution so you can now post live internal links on Psoriasis Club, It's been tested by out chief testing department But if you do find any problems please let me know. #1: This one is for adding a link to another thread in your post. Add the code below to your post but change *** for the tid number. 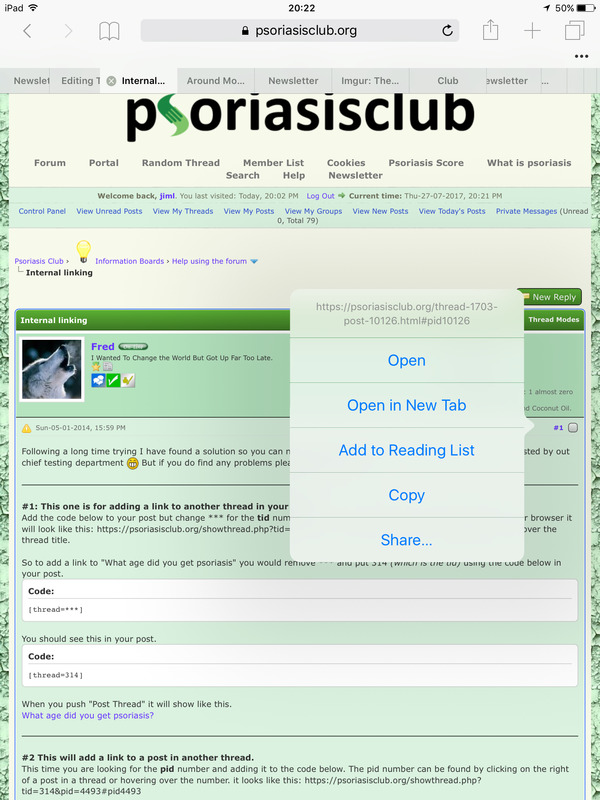 you will find this either by looking at the URL in your browser it will look like this: https://psoriasisclub.org/showthread.php?tid=314 or some of you can find it by hovering your mouse over the thread title. So to add a link to "What age did you get psoriasis" you would remove *** and put 314 (which is the tid) using the code below in your post. You should see this in your post. When you push "Post Thread" it will show like this. What age did you get psoriasis? #2 This will add a link to a post in another thread. So to go to post number 10 in the above thread you would add 4493 to the code below. So you would see this in your post. Click "Post Thread" and it will show like this. RE: What age did you get psoriasis? #3 This one will add a link in your post to a board. So for that you will add 7 to the code below. That will show Psoriasis And Psoriatic Arthritis Topics & News on your post. You're welcome to try them in the [Group Specific] board if you want. * If you see [Group Specific] any time it's because you are not logged-in, or you are not a member of the relevant group to see the thread/post/etc.